Abstract: Samsung Tantus SPL4225 Plasma display measures an impressive 42inches across, and a scant three and a half inches thick. After watching countless DVD's on good old televisions, tiny computer screens, high-resolution LCD displays, and even rear projection HDTV's, I can say without a doubt; once you go plasma you never go back! 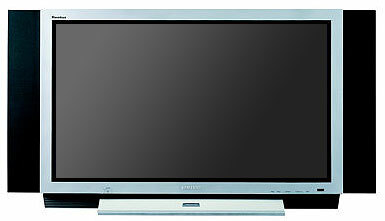 Samsung's Tantus SPL4225 Plasma display measures an impressive 42" across, and a scant three and a half inches thick. The image quality is just luscious, and if you can forget about the nearly ten thousand dollar (CDN) price tag (see here) for a moment, there is virtually no downside to this display. With three similar models currently in the Tantus plasma screen line up, it is this unit, the SPL4225, and not the 50" or 63" versions which has the best overall specs. Boasting a 16:9 aspect ratio for optimal wide screen viewing, a 700:1 contrast ratio and 600 nits brightness level, the SPL4225 is visually superior to an equivalently sized rear projection HDTV when compared side by side. If that doesn't wet your whistle, just consider the 852x480 resolution progressive scan display bears no cooling fans to create distracting noises and the screen specs out with 160 degree viewing angles in both axis. Pixel pitch is 1.08mm, and the display is capable of representing 16.7million colours - much like an LCD TFT display. Weighing in at just over 70lbs, the SPL4225 Plasma display draws 310W in operation and comes with integrated handles round back to make setup that much simpler. The display ships by itself with optional extras including a table top stand, side mounting 10W speakers, or even a metal wall mount frame. Released under the Tantus home theatre brand, this 42" plasma display offers up a lucious picture with superb clarity. Built in variable aspect options include Wide Screen, Zoom, and Panorama modes so if your DVD player doesn't come with those features already, there is no cause for concern. The standard Samsung all-in-one remote control will work with other Samsung consumer electronic devices (VCR, TV, DVD, etc.) or with most brands you are likely to have in the house. The ergonomics of the blandly gray remote are sufficient, but the industrial designers could have done a whole lot to make the remote a little more appealing to the senses. The SPL4225 remote is just reall not very representative of the wicked 42" plasma screen it reigns control over. Better luck next time I guess. On Screen Display (OSD) menus are overlayed on the screen (so you won't miss that winning goal if you have to change the speaker setting to Stadium, and are blessed with a very user friendly look and feel. If the remote is ever lost in the recesses of couch, there are control buttons located on the bottom right of the plasma display itself which will allow you to enter the OSD regardless. This may seem like an no brainer, but if you've ever owned a piece of equipment where all the controls and settings were accessible only via the remote, you'll know what I'm alluding to. Round back, the Tantus SPL4225 comes with a ton of signal terminals including; two sets of component video inputs (480i/480p and 480p/720p/1080i), one 15-pin DSub RGB computer display input, an RCA video input, S-video input, and four sets of L/R RCA audio inputs. If you opt for the side mounting speakers, there are also a set of left and right 7W wired speaker terminals. The Samsung SPL4225 comes with a rather dinky set of component video inputs cables, so your first stop should be at the local electronics store to pick up a good set of shielded component video inputs cables if your DVD player supports this standard (if it's recent it should). It seems there is a fair amount of ambiguity surrounding just how a Plasma display actually makes a visible picture on the screen. One person I spoke with described a plasma display as a cross between a CRT and an LCD display - that isn't quite accurate, but it's a good place to start from. Unlike a CRT display which shoots electrons through a metal mask onto different coloured pixels (red, green and blue), a plasma display uses little cells of excited Xeon or Neon gas to create ultraviolet light based on a digital signal. The plasma panel is made up of an array of tiny cells which we all know as pixels. However, each pixel contains three subpixels of phosphors corresponding to the colours red, green and blue. Sandwiched against these cells is a thin layer of gas in a plasma state. Electrical impulses enter the gas, which emits bursts of ultraviolet light at precise locations, and intervals, as determined by the digital video signal. The phosphor cells absorb these signals and then re-radiate the energy as visible light in varying intensities. The simplest way to think about each of these three subpixels is as little fluorescent lights which together form a matrix of tiny 1.08mm x 1.08mm pixels. Since each pixel is physically separated from the adjacent ones by a rib, the display has small visible black vertical lines if you look closely. Now, let's take a closer look at the Samsung SPL4225; its speaker system, and the quality of the picture displayed.